In the last post I talked about prayer as a ritual of hallowing that we use to give life sacred texture. Before moving on from the subject of prayer as a ritual of hallowing, I also wanted to mention a closely associated practice, anointing with oil. A discussion about anointing with oil also connects us back to earlier posts in this series about the use of sacramentals within the Catholic tradition. As I've written about before, my faith tradition the Churches of Christ has been pretty skeptical and wary of charismatic and pentecostal impulses. Consequently, as I describe in my recent book Reviving Old Scratch, I was caught off guard when I first started attending Freedom Fellowship. Though a church plant sponsored by the Highland Church of Christ, Freedom Fellowship is a lot more charismatic and pentecostal. Freedom has an indigenous spirituality unlike anything I've experienced in the Churches of Christ. I think this is due to the fact that a lot of the people Freedom attracts--the poor and homeless--have been shaped by charismatic and pentecostal traditions, and they have imported that spirituality into the congregation. Relevant to our discussion about rituals of hallowing, one of the distinctive aspects of the spirituality that has emerged at Freedom is anointing with oil. At Freedom we anoint with oil very regularly. 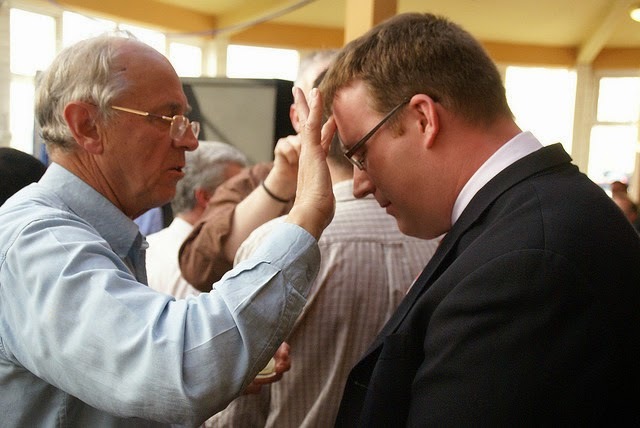 If someone prays over you, and this happens a lot, very often they will anoint your head with oil before they pray. Brothers and sisters at Freedom carry oil around with them so that, if anyone needs prayer, oil is always on hand for that purpose. When I go to Freedom I grab two things, my Bible and a small bottle of anointing oil. You never know when you or someone else might need it. The first time I was ever anointed with oil was then I was at church early having driven the van bringing people to the dinner we have before every service. I was coming down with a fever and I was shaking pretty badly. Mary came up to me to see if I was okay and I told her I was coming down with a fever. Mary prayed over me and before she did, as we do a lot at Freedom, she anointed my head with oil, making the sign of the cross, "In the name of the Father, and the Son and the Holy Spirit." I was pretty well hooked at that moment. Maybe it was the fever, but I became all in with the oil thing. And reading authors like Sara Miles, as I mentioned in yesterday's post, has helped deepen my appreciation of the practice. To be clear, I understand reservations about this practice. It can look a little weird and strange. Especially if you're a doubting and disenchanted Christian. But that's exactly why I'm so taken with the practice. Like I mentioned in the last post, in this secular age I think we need rituals to signify holy ground. I think we need sacramental practices of consecration and hallowing. I think we need to feel a loving touch on our face. I think we need to pray with our hands. I think we need to be marked to remember who we are. I think we need to experience grace in the tingle on the skin and the smell of incense on our foreheads. I think we need liturgies where we stand before each other, eye to eye, because very rarely at church do we stand so close. Rarely have I anointed anyone without crying. And I think we need to look at each other and cry a little bit more at the beauty of it all. You might not anoint with oil where you worship. And introducing the practice into your world might be a little too weird. But there is a sacramental wisdom here. A way of seeing each other. A way of praying. A way of loving. A way of edging us--with sacramental touch--back toward enchantment.